After Benq P50, the company brings you the new P51 with the brand Benq-Siemens. The P51 is the first Smartphone to be introduced under the brand Benq-Siemens. 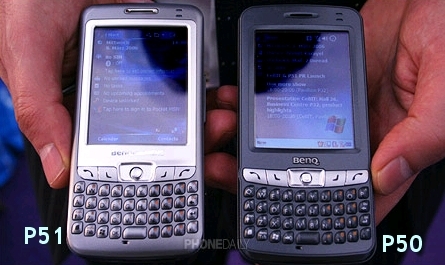 Compare to Benq P50, the new P51 ‘upgraded’ to Windows Mobile 5.0, equipped with GPS and WiFi and has a larger screen. The P51 features a 2.83-inch QVGA LCD screen, a full QWERTY keypad, WiFi 802.11b / g, Bluetooth and GPS connectivity. The device also sports a 1.3 Megapixel camera and built-in 128MB ROM and 128MB RAM. The phone will probably be available in Q3 in Taiwan but no words yet on price. More Pictures below.